Of the six Volkswagen up! 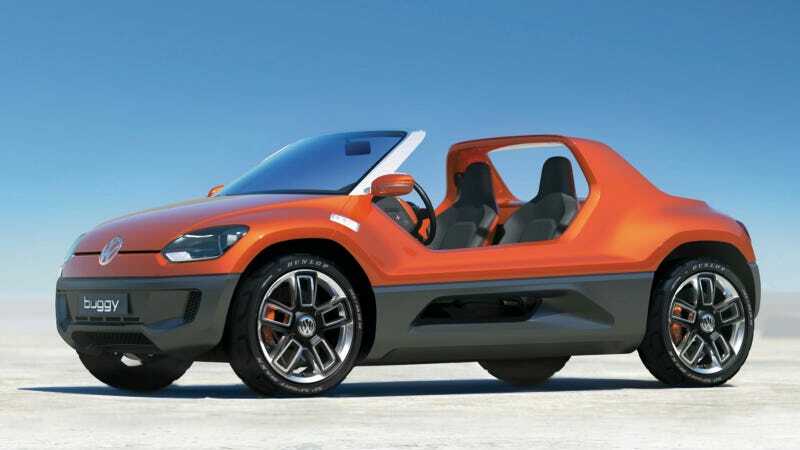 concepts that were trotted out back at the 2011 Frankfurt Auto Show, the one that least looked likely for anything other than sitting on an auto show floor was this roofless, doorless homage to the Meyers Manx Buggy. Considering that the standard up! majors on practicality and efficiency and would probably find a market in this country against competitors like the Chevy Spark and Smart Fortwo, the Buggy looks like this whimsical piece of nostalgia that would really generate smiles more than lots of sales. But that's exactly what VW wants you to think. Autocar reports that patents granted in the US show the Buggy version of the up! inching closer to production reality. They say VW wants more modern takes on iconic cars like the Beetle to draw American buyers in. The Buggy would be in honor of the fiberglass Meyers Manx dune buggies that were based off of modified Beetle chassis in the 1960s. No word on when the Buggy version of the up! would go on sale, but it's likely it'll be powered by the same three-pot 1-liter as the other cars (a turbo would be nice, VW). I have no idea who would buy a Buggy up! but it's kind of a neat idea to offer something that is counter what's going on at your local VW dealership. Just don't think it can handle anything sandier than a beach parking lot.